If you don't believe a burger is worth a damn until there's a slice of cheese creating a melty roof on your burger train, today is your day. Tuesday, September 18 is National Cheeseburger Day, and cheap burgers are raining from the sky. Restaurants all across the country -- everywhere from McDonald's to Wayback Burgers -- are offering deals in honor of the cheeseburger's big day. Some of the best deals will get you things like buy-one-get-one-free burgers and bottomless fries, but there are tons of ways to fill your craw with cheeseburgers for the occasion. 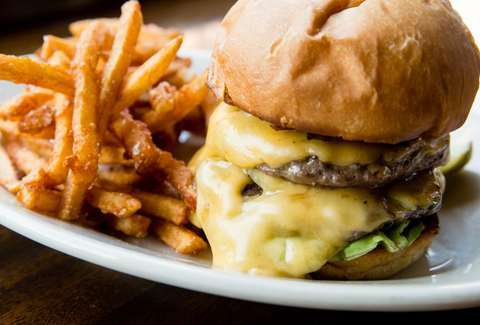 Check out our running list of National Cheeseburger Day deals below. The deal: Grab a free cheese slider with a purchase of any kind. Nice. The deal: For the entire month of September, Wendy's is offering a free Dave's single burger with any purchase. That means you can buy some fries and get the burger for free. The deal: Remember that whole IHOb thing? The pancake den isn't done conflating burgers and flapjacks. Order an Ultimate Steakburger and IHOP-not-IHOb will give you a free stack of pancakes and a side. The deal: Download the Wayback app by September 17 and you'll find yourself the proud owner of a buy-one-get-one-free promo for a Wayback cheeseburger. The deal: Join the So Connected email club, and Ruby Tuesday will drop a free burger into your account. If you're already a member, you'll get it too. It's a voucher for a free burger up to $10 with the purchase of another entrée. The deal: Join the burger hub's Clubhouse rewards program, and it'll start you off with a free burger. You don't have to buy anything, and there's no catch. That one is on the house. The deal: OK, it's not a cheeseburger, but the deal launches today and you're getting a free sandwich out of the deal. Sign up for the Potbelly Perks program and you can get a BOGO deal on sandwiches. The deal: The hotel burger joint is handing out 10,000 free Classic cheeseburgers at its 26 locations in the United States and Canada, while supplies last. You don't have to be a guest at the hotel and you don't even have to buy anything to take advantage fo the deal. Just show up before they're all gone. The deal: The Pat LaFrieda location in the New York food hall is offering a free burger to the first 200 people through the door on Cheeseburger Day. Additionally, it's teaming up with Sam Adams for a Boston Lager-infused bacon cheeseburger that will be available through September 25. The deal: Stop into Red Robin and you can grab a cheeseburger and bottomless order of steak fries for just $5 with the purchase of any beverage. The deal: Locations nationwide are offering a $1 cheeseburger with the purchase of another cheeseburger. It comes with two Angus patties, two slices of American cheese, lettuce, tomato, and BurgerFi sauce. The deal: At just $1, Farmer Boys' Big Cheese cheeseburger is damn near free all day long. The deal: You have to assume it's Hamburglar's birthday today. Celebrate with a $1 sandwich from McDonald's. 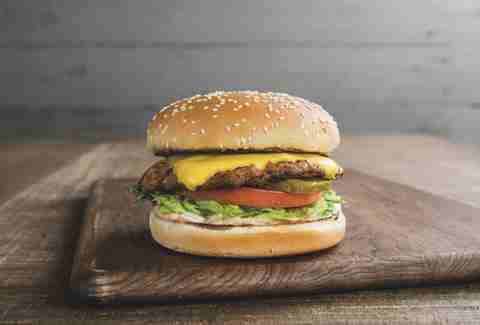 Tons of the Golden Arches' burgers are just a buck with an offer you can find in the mobile app. The deal: Hop on their site and get 25% off any order. It'll also be hosting "free cheeseburger giveaways" on their Facebook and Instagram pages throughout the day. The deal: The signature FB Burger will be available for $5 (normally $8-10) at all 13 locations. The deal: Buy-one-get-one-half-off on cheeseburgers and milkshakes from open to close. The deal: Take the 3-Pound Burger Challenge at one of the Fudd's participating locations if you dare/really like stomachaches. Eat the entire three-pound burger and a pound of fries in under an hour and you'll win a $25 gift card. You'll also probably get a new nickname from your friends. No guarantees you'll like it, though. The deal: Anyone in the Los Angeles area can enjoy free delivery from Fatburger through Postmates all week long. No delivery minimum and no code required. The deal: Founded in 1923, Flint's Halo Burger is one of the nation's oldest burger brands. To celebrate their beloved burgers and the company's anniversary, you can grab a quarter-pound burger for $1.95. The deal: If you've downloaded the My Hwy 55 mobile app, you'll find a National Cheeseburger Day deal. You'll get 50% off every burger combo from 5pm until close at participating locations. The deal: The Plain and Simple Burger is usually $10.75, but if you're a member of the ZinburgerVIP loyalty program it'll cost just $5. The deal: For a limited time, you can treat yourself to a 50-cent Frosty. 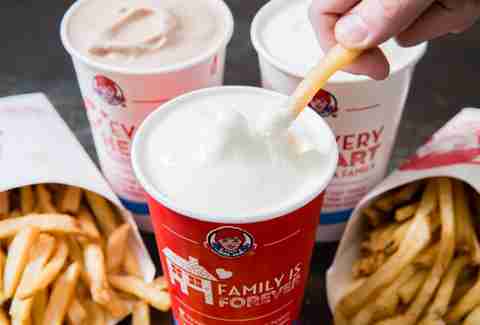 The price makes it taste even better when you dip fries into the Frosty. The deal: To celebrate the return of the Panda's Honey Sesame Chicken Breast, get $3 off any online order of $5 or more with the code "HONEYISBACK." It's not free, but it's better than Bee Movie. The deal: First responders, active military, firefighters, police, and EMTs can pick up a free ground beef taco or vegetarian taco all month just by flashing their ID as a thank you for your service. The deal: Grab a free appetizer with the purchase of any two entrées, but you're going to have to show your server a coupon from the restaurant's website. Call your parents, they can explain what a coupon is. The deal: All month long, you're getting 10% off your order and a chance to win college football tickets when you use the code "SUBABOVE10." If you know of a National Cheeseburger Day deal that we missed, feel free to send the details over to news@thrillist.com and there's a chance we'll add 'em here.